When leaders try to motivate their organizations for Change, we sometimes hear justifications like, "The definition of insanity is doing the same thing over and over again and expecting different results." Or sometimes we hear, "If you keep doin' what you're doin', you'll keep gettin' what you're gettin'." 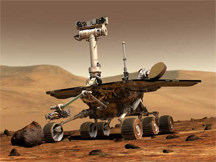 Artist's concept of the robotic explorer Opportunity on Mars. Photo courtesy U.S. NASA Jet Propulsion Laboratory. The reasoning is, "We're all unhappy with what's happening now, so let's try this new proposal — it's bound to be better." Plausible enough, until you think about it a little more carefully. Here are three reasons for doubt. We might like to believe that an organization can reliably repeat a set of actions, but if people are involved, it isn't really true. First, management rarely has a level of control over the rest of the employees sufficient to justify the claim that exact repetition is possible. But more important, we as people don't have that kind of control of our own actions — we're humans, not robots. We have good days and bad. Precise repetition is impossible, and that's often one reason why results are so variable. Even if we could repeat a set of actions precisely, the context in which we act is always changing, and that affects the outcome. Imagine a football team believing that since they scored once using a certain play, all they have to do to win is to execute that same play exactly again and again. The folly of that belief is evident as soon as you recall that there's another team of thinking people on the field. And so it is in business. is impossible.Even if we could repeat our actions precisely, and even if the context were constant, we can't be certain that the initial circumstances are what we think they are, because we can't know all there is to know about them. That is, we choose our actions based on the situation, and that choice requires that we identify the situation. Since the world is far more complex than we can grasp, we use our intuition — we guess. And we can't be certain that we make the same guess in the same circumstances every time. Given all this, a more accurate version of the slogan might be, "The definition of insanity is doing precisely the same thing over and over again, ensuring identical circumstances and a deterministic universe, and expecting different results." But then, that slogan isn't nearly facile enough for the intended effect. Would you like to see your comments posted here? rbrenpfKmqFOskvHLJTEfner@ChacigmBQBzNFxxdvnJRoCanyon.comSend me your comments by email, or by Web form. See also Organizational Change and Effective Communication at Work for more related articles. I offer email and telephone coaching at both corporate and individual rates. Contact Rick for details at rbrenyHnBViPJVTsgwVEGner@ChaczMloXweMEpkhCBTmoCanyon.com or (650) 787-6475, or toll-free in the continental US at (866) 378-5470.